3 Noisy Engine Valve Tap Remedies. Which is the best-to-the-cheapest way to restore your car's smooth quiet engine performance? Noisy engine valve Contact Info: On a smartphone, to ask a question, order items listed, call me...george at 512 665 3388. Engine noises - sounds from worn parts, and different from a tapping sound - a distinct sound of its own, both have the same cause - dirty, sluggish working engine parts. It does not takes much more than a cup of residue to start engine noise and a noisy engine valve tap. A tap seems to cause a more worrisome response from the car owner, and rightly so. You would think your costly oil should clean this mess up, but it does not! Even your well taken care of engines develop tapping sounds because your motor's 12 to 24 piston rings become dirty, lazy operating. 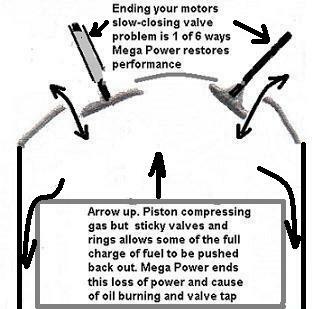 Piston rings, as they become dirty, lazy cause a drop in horsepower-making by allowing hot, highly acidic combustion to slip pass them to mix with the motors oil. Combustion turns some of you oil into sludge, which one day then makes you clean shinny engine parts dirty, lazy operating. During engine rotation the space closes with a hammer-like tap tap tap sound. That's no good, of course! and a cause for worry of whats to be. don't worry, I have the best cheapest remedy for you! What mechanics do to end the tapping. Mechanic's take apart the motor, clean your 8 to 24 dirty valves. Then replace the 8 to 24 valve-lifters I call adjusters - both the cause of tapping. This week long repair endeavor can run over $3000. Yet, often times just one part is the noisy engine t valve. Can part store additives work? Some car owners try part store additives. Mostly, flush solvents, but find their engine runs worse - as part store additives clean to well, stripping residues from their place and often blocking oil from bearings. Oil flow blockage damage is then a new engine problem. How - Mega Power ends noisy valve tapping. Mega Power Valve Treatment is not a solvent! Because several types of residues cause the noisy engine valves and tapping, including dirty, lazy piston rings It requires 6 different cleaners to stop the tap. Mega Power ingredients provide the 6 complex cleaning, lubricating actions needed to stop the tap. It is by this chemical invention of cleaning and reconditioning that closes the spaces to zero that stop noisy engine valve tapping. Mega Power, a noisy engine valve treatment anyone can install, stops noisy engine valve tap with MC+! Add to motor. Driving ends tap. Simple, fast, effective, permanent! Mega Power has found the 6 items needed to end valve tap. Order now! This picture illustrates these tap and secondary problems a new product called Mega Power is helping motorist end - Reviewed below. Right now...Note the other cause of noisy engine tap - in the picture...below. ...residues build up over them, they are hard to push open - and close lazily. This creates a space where rotation causes valve lifters to smack them making the tap tap tap noise. I bet your mechanic does not know that! Mega Power Valve Cleaning Engine Conditioning Treatment will clean and free those residues - even synthetic oil cannot, and end the noise for you. Valve lifters can also cause a tap and Mega Power ends that slource for you too! Since more is needed and Mega Power includes it! Mega Power has found the secret that ends noisy engine valve problems by means of 6 ingredients. Otherwise, its something of a $3500 plus engine repair and $400 worth of new valves - as the usual fix. Mega Power avoids such repair needs - restoring full performance, and saving car owners a bundle of money. Item shown Below. One Mega Power Valve Treatment Includes 6 items shown. Easy-to-follow directions. Phone help if needed. Satisfaction Guarantee. Shipped to your door by FedEx in 3 days. Just $85, plus $15 s&h= $99 total. Price increase subject to change to soon. Order now! Save your car and your budget! Order 2 Treatments protect both your cars, save $40. 12 items. $135+ $15s&h=$150 total. Not $190. Save $40. Subject to an advertised price increase, soon. Order Now! Subject to end soon! Even though Mega Power is a professional engine cleaning product for mechanics - I train mechanics those that want, in its usage. I'll show you how to install Mega Power just like a pro, too - to end your motor noise! Stops noisy engine valve tap as you drive! Many, who have spent up to $3000 for repair to end that tap - did not know a Hi-tech, lo-cost engine treatment from Mega Power - will do the fix for under $250 - if a mechanic installs the product - in place of repair - or as the repair. Under $100, if the car owner does so. It's easy to install with my tips helps and steps below. Works fast! High success rate. Mike, a customer, says of his experience: It was like hearing his noisy engine sounding like nerve-racking acid rock band sound, to a symphony sound. That means: he was very delighted to see it help his engine. Your will be, too! Please Note: 2 refunds last 267 days. Order now! success guaranteed! Many, who have spent up to $3000 for repair to end that tap - did not know a Hi-tech, lo-cost engine treatment from Mega Power - will do the fix for under $250 - if a mechanic installs the product - in place of repair - or as the repair. Under $100, if the car owner does so. It's easy to install with my tips helps and steps. 2 easy to do install steps - nothing to take a part! You now have a choice: Fix your noisy engine valve by expensive repair. Or my choice to add this Mega Power Treatment to your fuel and oil to quiet the knock and end your noisy engine valve tapping - or pay for a costly repair to do so! Just $85, plus $15 s&h= $99 total. Order now! Save your car and your budget! Many kinds of valves make today's engines and transmissions the marvel they are today. In transmissions, dirty valves cause rough shifts. Tapping noise in engines. The usual fix - by a mechanic is to dismantle your motor [$1500] and clean what he can. Perform some needed machining task on valve and replace valve adjusters [$550]. Replace your oil pump - to assure full oil pressure [$125]. Install all new set of gaskets [$250]. That's the traditional method. And wish you the best! Dirty Noisy Engine Valve Conditions reduce horsepower - making the motor seem older and more worn that really so. Mega Power cleaning stops the tap and restores lost horsepower - by simply restoring the years-before clean-smooth-operation again! Mega Power cleaning is what gets in there where nothing else made so far, can end your cars hammer-like tapping! ...See pic of valves - as upside down T's- in the picture. Mega Power's uses 6 items. They end the cause of the noise. Below shows how to order the simple 2 step install product that does the actual fix for under $250 -if a mechanic installs the product. Under $100 if you do it yourself. Its easy! Way cheaper than the $3000 way and "just as good" every customer concludes. Mega Power stops your noisy engine valve problems and the tap sound by closing the gap - the cause of the noise. After you install Mega Power into your gas and motor oil, the install easy to do, and drive. The ingredients go to your motor-oil-pumping system, and your motor's fuel combustion process - cleaning those areas - and movement forces Mega Power's 6 cleaning ingredients into your dirty, sticky, valve stem bores - removing the glue-like sticky residues. You can chemically stop your engine noise - a tap tap tapping sound, with this product for as little as for $100 if you do the easy install. For about $250 - if a mechanic is found selling and installing it. This beats, by a fraction of that $3,500 repair expense most mechanics want to charge you, to end your noisy engine valve by new part replacement. Where do you stand on this choice, anyway? Why continue to let your motor beat itself to death when Mega Power will end its noisy engine valve tap and restore it quiets strong performance, for years to come. Waiting could cost you $1500 instead of $100. One Mega Power Valve Treatment Includes 6 items shown. Easy-to-follow directions. Phone help if wanted. Satisfaction Guarantee with no time limit! Shipped to your door by FedEx in 3 days. Includes 6 items shown. Easy-to follow directions. Even Free phone help if needed. Guarantee. shipped to your door in 3 days. Just $85, plus $15 s&h= $90 total. Order 2 Treatments protect both your cars, save $40. 12 items. $135+ $15s&h=$150 total. Not $190. Save $40. Subject to an advertised price increase, soon. Order Now! Ingredients in Mega Power work with heat. Noisy engine valve Home Page. Why part store additves don't work!